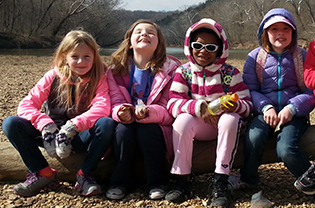 Girl Scout Troops, including Daisies, Brownies, Juniors and Cadettes can explore the wonders of nature at Shaw Nature Reserve! Programs are aligned with Girl Scout Journeys themes and badges. See each program's description for details. Discover and explore with us! Go on a nature adventure with us! Put on your water shoes, grab a net and come see what lives in Brush Creek. We’ll discuss the plants and animals that call the creek home. Be prepared to get wet and have fun! Please also plan for a ¾ mile hike (round trip). Scouts will earn their Clover Award as we discuss how to protect these wild and wonderful places. Program length is 2 hours. This program is available July-September. Go on a treasure-hunting adventure with us! Make your own unique stamp and notebook, then practice following number code clues. Then venture outside to use your new skills to discover letterboxes hidden throughout the prairies, forests and wetlands of the Reserve. This program completes requirements 1-4 of the Letterboxer badge. Enjoy hot chocolate when the program is conducted during the winter months! Program length is 2 hours. This program is available July-September and December-February (Saturdays only). Learn the wonders of a flower and uncover the science behind them by dissecting them yourself! Be an ethnobotanist as you learn about the traditional and medicinal uses of flowers. Create a meaningful flower bouquet to take home to a loved one. Scouts will also plant a flower fit for a medicinal garden! Scouts will explore the prairie discovering various medicinal plants. Meets all requirements for Flowers badge. Program length is 2 hours. This program is available July–September. Get ready to know trees! Learn how to identify some Missouri trees and find out about their uses. Learn about the effects of logging, clear-cutting and deforestation and what you can do to help trees thrive for the benefit of future generations. Scouts will also get to observe how maple syrup is made (weather permitting)! Meets requirements 1–4 of the Trees badge. Program length is 2 hours. This program is available in February only. NOTE: Scouts will collect sap only during tapping window, weather permitting. 2020 season dates TBD. Celebrate your troop’s accomplishments and hold your Scout bridging ceremony at one of the area’s most beautiful locations!